Women irrespective of its class, caste and education status have been the most underprivileged and discriminated strata of the society not only in India but across the globe. Despite in substantial contribution of women in both household and national economy, their work is often considered just as an extension to household domains. Women have been victims of the exploitation since a long time in different fields in their life physically, mentally, socially and economically. Stereotype gender roles divide the inequalities in opportunities for women in all spheres right form education, healthcare, employment, property rights, and political career, etc. Women in Indian societies most often have been exposed to domestic violence, molestation, sexual exploitation, and dowry-related crime. Though the discrimination is across the country irrespective of class and caste, the situation in urban settings is more worsen especially for urban poor women. While cities are often considered as places of opportunity, they also create and feed conditions in which poverty spreads. Poor in India’s urban and semi-urban areas battle against the harsh realities of urban poverty created due to rapid urbanization. The growing urbanization has led to problems of land shortage, housing shortfall, and congested transit and has also severely affected basic services of water, power and open spaces of towns and cities. This has resulted in people increasingly living in informal and squatter settlements. Urban Poor, despite having significant role in economic growth of the cities they remain to be bottom of pyramid in access to basic services and entitlements such as housing, humane working conditions, basic amenities including safe drinking water, affordable quality education, nutritious food and health care due to lack of information and knowledge on their rights and entitlements. Amongst them, women are more vulnerable. About half the women and children in urban areas are estimated to be anemic and undernutrition. Besides housing and other basic services, their financial needs have also been overlooked. Despite the existence of a good banking network in the city, according to census 2011, 32% of the total urban Indian households do not have a savings bank account. Amongst them, women being most underprivileged strata of the society are the most ignorant client of the financial sectors. Though the government has made financial inclusion a priority agenda, accessible savings systems and credit facilities are still very much out of reach of the poor, particularly in slum communities. Low and irregular earnings, migrant nature of the population, inability to produce adequate documentation, bigger family size with single earning member and financial illiteracy leading to poor money management skills are some of the factors keeping them out of the formal financial services. They are also deterred by problems in understanding language, inconveniences related to traveling and waiting for time and other conditions that come with the formal financial system. In lack of access to formal financial services, they have to depend on usurious informal sources (most often money lenders) to meet their personal, health, and livelihood-related needs. Not surprisingly, they struggle to repay such borrowings, which further impede their ability to escape the vicious circle of poverty. Micro Finance dominated by Self Help Groups (SHGs) emerged as an effective mechanism for providing financial services to “unreached poor” in order to combat poverty and also in strengthening their collective self-help capacities leading to their empowerment. Rapid progress in SHGs formation has now turned into an empowerment process among women both from rural and urban across the country. Micro Finance became an important tool to overcome exploitation, create confidence for economic self-reliance of poor women. It has proved its potential contribution not only to create women’s ability to earn, rather proved to be an important mechanism for women’s empowerment in all spheres including social, economic and political. The government of India through its National Urban Livelihood Mission (NULM) provides financial support to SHGs and their federations to initiate economic activities and strengthen their collective efforts. Urban Cell of Kutch Mahila Vikas Sangathan has organized urban poor women under the umbrella of ‘Sakhi Sangini’, a federation of SHGs. 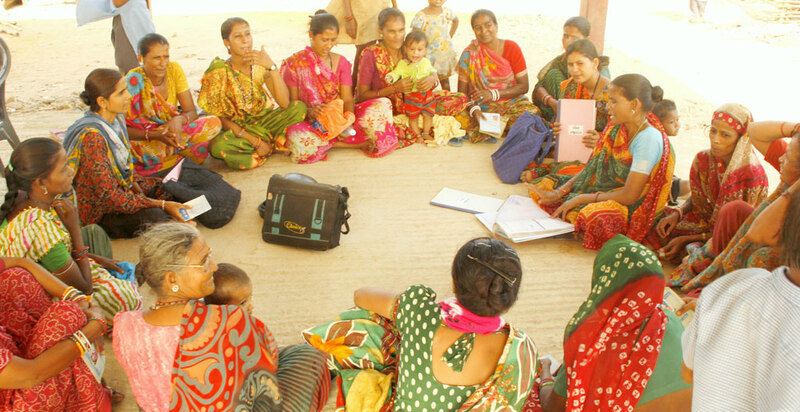 The federation provides the platform to resource-poor women of Bhuj city and adolescent girls for voicing issues of their concerns and helps design suitable remedial solutions to overcome the situation. This federation is committed to women’s empowerment and safety. As part of this vision, the federation facilitates capacity building and nurturing these women and girls, create spaces and opportunities for them and also execute programs and interventions that determine their identity as leaders. Women disproportionally experience poverty, stemming from the unequal division of labor and lack of control over household economic resources. We found that many women remain dependent upon their husbands and have no control over household spending. India is one of the biggest markets for prostitution in Asia with Mumbai alone accommodating 2,00,000 prostitutes (Goyal 2011 ). Poverty is one of the main factors, which brings helpless women to the doors of prostitution. In India, where almost half of the population are women, they have always been ill-treated. Even as a citizen, they are deprived of their right to life and personal liberty as provided under the constitution of India. Being a citizen of Bhuj, I had witnessed a lot of discrimination when I was an adolescent, towards girls of my age-group within and outside my family. Then, it was through KMVS, when I was working in slum areas that I observed with more clarity how parents expect girls to live and act as per their wish.